Wellness is primarily a function of the genetic behavior code. Joel Marie and Champion Kurt Teutsch discovered this sensational truth over 40 years ago. They modified the code for over 100,000 grateful clients, among them business, show biz and political leaders. Since 1959, millions more benefited through “From Here to Greater Happiness.” This landmark volume spawned at least 57 self-help books. 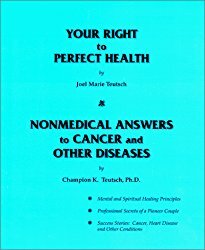 This book is about non-medical answers to Cancer and other diseases. You can heal all ailments. Any person can have excellent health if he goes after it in the right way. Good health is not the gift of a whimsical providence to a favorite few. …It is a wise thing, especially during the early days, to avoid the company of those whose chief topic of conversation is sickness, funerals, poverty, failure and needs. This is not snobbishness, it is merely self protection.